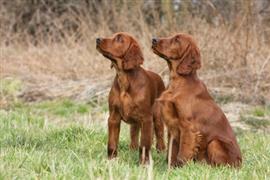 Naming an Irish Setter can be as easy as digging down to its roots. There are plenty of perfect Irish names for both male and female puppies. A few of the top options for Irish males are Hogan, Murphy, and Aidan. Owners of females tend to favor the Irish names Abby, Teagan, and Ciara. The Irish Setter is easily identified by its reddish coat color. Some names inspired by this defining characteristic include Clifford, Auburn, Cherry, Cinnamon, Dahlia, and Rose. The breed is a gundog at heart and known for its abilities in setting and pointing gamebirds. Every good hunting dog needs a fitting name. Jake and Ace are some common favorites that are easy to call. Themed ideas include Hunter, Cabela, and Remmy. For a hunting dog duo Smith and Wesson is a popular way to go. No list of names for a dog with Irish roots is complete without the beer. Guiness, Murphy, Ohara, and Harp are few name ideas taken from Irish brews. Some of our pages will contain a subcategory. A subcategory is a slightly more specific grouping than the main topic of the page. For a subcategory, we will include a separated table of names and corresponding descriptions. An example of a subcategory of Red Dog Names would be 'Dog Names Inspired by Red Wines'. If you have any subcategory ideas for the Irish Setter Names page, we would love to hear them. Use the form below to submit your ideas.